Hafeez sheikh is a very creative painter whose expertise lies in Islamic art. The beautiful array of his work can be seen on his website. His paintings are unique among his contemporaries. Most of his paintings manifest his love for Allah Subhanahu Wa Ta'ala (English: “Glorious and exalted is He." In short: SWT) and his messenger Muhammad (Peace be upon him, In short: PBUH). In Arabic, the word Allah (See Art: 99 Names of Allah & The Word Allah) means ‘The God’. It is derived from the union of the word ‘Al’ meaning ‘The’ and ‘Ilah’ Meaning ‘God’ (See Art: God in other languages). The word Allah is the supreme and all-comprehensive divine name. The name Allah is unique and unmatched and indicates the existence of one creator of the universe who is omnipotent and all-powerful. To test what Allah can be, he has given an acid test in his book as he speaks to his servant (Prophet Mohammad) in The Holy Quran. There are many other names of Allah mentioned in the Holy Quran, but these other names are attributes of the creator. Allah is the best and the most suited name for God. It’s a common misconception that Allah is only the God of Muslims or people from the desert. In reality you will find Arab Jews and Christians calling upon Allah in their prayer, and even a Chinese Muslim will call upon Allah in his prayer. ‘La Ilaha illallah Muhammad Ur rasool Allah’ [There is no god except Allah and Muhammed is the messenger of Allah] is the central dogma of Islam around which the entire belief system revolves. It is mandatory in Islam to have absolute and unquestionable faith in the oneness of Allah SWT and that Mohammed is the last Messenger of Allah. The name Muhammad in Arabic means Highly Praised. It is derived from the root word ‘Hamd’ meaning praise. Prophet Muhammad Pbuh was the Chosen One who received revelations (Ayah meaning Signs) from Allah SWT. These revelations were brought to him by angle Jibrael (Gabriel) AS. He reported receiving these revelations until the day of his death. These revelations are regarded as the Word of God which has been compiled as the Holy Quran. The entire religion is based on the Holy Quran. Prophet Muhammad’s life and his traditions (Sunnah) are of great significance and Muslims follow his traditions all over the world. Allah SWT has 99 names (See Art: Names of Allah). The 99 names of Allah SWT are called ‘Asma Al-Husna’ which in Arabic means ‘The Most Beautiful Names’. These names are attributes of Allah SWT by which Muslims regard God. To your surprise an English Author David Bentley who is a Christian was so inspired by these beautiful names of God that he has written a book called “The Beautiful Names of God” which is a very inspiring book for Muslims, Christians and Jews as they all call upon the same GOD (Allah in Arabic, Elohim in Hebrew and Theós in Greek). The list of all the beautiful names of Allah SWT mentioned in the Holy Quran have been enumerated and one who recites these names with faith and applies the attributes each name suggests to Allah SWT will enter paradise. Some of the names of Allah have been concealed from mankind; hence there are more than just 99 Names of Allah SWT. Muslims can use the names of Allah for themselves prefixing them with the word ‘Abd’ which means ‘Servant of’. Here is a list of all the 99 names of God. 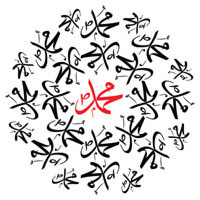 There are more than 99 names of Prophet Muhammad Pbuh (See Art: Names of Muhammad) which are attributes of him but we have just listed only the most common 99 names for the full list visit muslimbabynames.net. Recitation of these 99 names is of great virtue. Artist Hafeez Sheikh is a very devoted man and he has been blessed with an amazing talent – a talent to convert his vision into a beautiful piece of art. He nurtures this talent and the proceeds from his work entirely go to the benefit of orphan children around the world. 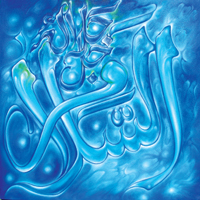 His love for Allah SWT and Islam are very well reflected in his paintings. He has used the best of colours and strokes to create a collection of some very unique and exceptional paintings. His paintings include the 99 beautiful names of Allah SWT (See Art: 99 Names of Allah) and The 99 names of The Prophet Pbuh (See Art: 99 Names of Muhammad). You can see them on his website gallery (Visit: http://arthafez.com/gallery.html). Some Surah’s in the Holy Quran begin with some letters which are called abbreviated letters (Al – muqattaat or loh-e-quran) (See Art: Loh-e-Quran). Many theories have been given as to what their meaning could be. These letters are used singularly or in combination but it is agreed that they have a mystical meaning. Artist Hafeez Sheikh has beautifully captured the mysteriousness of these letters (See Art: Loh-e-Quran) in his paintings. The striking combination of colours and strokes leave you mesmerised. You can also see how skilfully Hafeez Sheikh has created the effect of a stained glass using paints (See Art: Islamic Stained Glass) keeping the Islamic theme in mind. He also masters in the art of Arabic calligraphy (See Art: Calligraphy). As beautiful as the Arabic language is, it seems more beautiful in Hafeez Sheikh’s artistic handwriting. Some of his early works also include paintings of nature (See Art: Autumn & Flowers). He has attempted to capture the magic of autumn (See Art: Autumn) on canvas and has excelled. He also gets inspiration from flowers (See Art: Flowers). The shading effect that he creates with his paints is so skilfully done that it brings the flowers to life.